Shooting sticks are helpful items when you find yourself shooting "out yonder." They are a great aid, especially when grass or brush prevent the hunter from getting in the prone position. Rifle enthusiasts are not the only shooters who enjoy the challenge of long-range shooting. Handgunners also like to test their skills on long-distance targets in organized competition, informal plinking or varmint hunting. Whether it's a rock, tin can, varmint or steel silhouette, many of us enjoy stepping up to this unique, yet difficult quest. There are several elements that affect the success of long-range shooting, but first I should probably define "long range." For the shooter with a .25 auto trying to topple a tin can, 25 yards can qualify as long range. For those using most magnum revolvers in a hunting situation, 100 yards is long range. On the silhouette field where any hit that knocks over the target is considered good, some shooters make 200-yard shots look easy. When shooting long range, knowing the trajectory, or path of the bullet, is crucial. Revolver rounds like the .44 Magnum suffer a great deal in this regard when compared to bottle-neck rifle cartridges. Let's look at a typical situation with a 240-grain bullet going 1,500 fps, which would be a maximum load. With the gun sighted-in at 50 yards, out at 150 yards the bullet will drop an amazing 14 inches, and, depending on what specific bullet you employ, it could drop even more. Out at 200 yards, the drop will increase anywhere from 25 to 30 inches. This requires the shooter to hold over and above the target substantially, bordering on a guessing game. In metallic silhouette competition, shooters know exactly how many clicks to adjust their sights for different distances, so they can hold the same place every time, eliminating the guesswork. Nevertheless, it is still vital that you know the exact location your gun and bullet will hit at various ranges. Examine the trajectory tables in the reloading manuals to learn how your specific bullet fares in this regard. Western plains hunting almost always calls for long-range shooting. The author took this fine pronghorn antelope in Montana using a T/C Contender chambered in .309 JDJ. One thing a shooter can do to help compensate for some of this drop is to sight-in at a greater distance--say 100 or 150 yards, for example. This will have the bullet hitting a little high at closer ranges, but the shooter will not have to contend with a drop of 30 inches at 200 meters. Many handgun hunters sight-in their revolvers dead-on at 100 yards. These same hunters sight-in their single-shots chambered for rifle calibers three inches high at 100 yards--just as many rifle shooters do. The fact remains that you should know exactly where your gun and load hit at various ranges. The only way this is accomplished is by going to the range and shooting from various yardages. Top-notch silhouette shooters consistently topple the steel ram targets at 200 meters using open-sighted, big-bore revolvers. They sometimes make it look easy. However, the silhouette game is a far cry from a hunting situation. Silhouette matches are held in broad daylight, and targets are perfectly broadside to the shooters at a known distance. Seldom are hunters offered this ideal situation. I would never attempt a shot at a big-game animal at 200 meters with an open-sighted revolver. It just wouldn't be fair to the game. In order to be consistent at long-range shooting, a quality sighting system is necessary. Many shooters use the traditional square-notch rear sight with some form of blade front sight. Color blades for the front sights are available if that is your preference. Depending on the target, most of the time I want a black rear sight and the same-color front sight since my eyes can only focus on one of those components anyway. Adjustable sights are highly recommended for long-range shooting. For recreational shooting, scopes or dot sights offer an obvious optical advantage. Most revolvers are best equipped with either a fixed 2X or 4X scope, but there is nothing wrong with some of the outstanding variables on the market. When shooting at long-distance steel targets, I prefer to have a consistent aiming point, like the top edge of the target, for example. I find that when I do not have this kind of aiming point and am forced to hold off the target, a lot of guesswork comes into play, and my shots will probably be all over the place. Big-bore revolvers, whether scoped or not, can provide a lot of fun long-range shooting. These quality six-shooters from Ruger, Smith & Wesson and Freedom Arms will provide the handgun enthusiast with years of service. I consider myself to be the kind of guy who likes to keep things relatively simple. I am certainly not a gadget freak, but one item I take with me to the range and especially on hunting trips is a laser rangefinder. While silhouette shooters are blessed with the knowledge of knowing exactly how far they are shooting, hunters do not have that advantage. Let's say you have spent countless hours on the range shooting your favorite hunting handgun with that super-accurate load you have developed at the reloading bench. You are familiar with the trajectory and where the bullet will hit at various ranges. All summer you have been shooting sub-minute-of-angle groups and, as a result, have acquired all the confidence in yourself and your equipment that is needed to fill that big-game tag. Now comes the moment of truth, and that 17-inch antelope, for example, is in your sights. You think he is a little over 200 yards away, but the terrain is deceiving and he is actually at 315 yards. All those shooting sessions and your superb marksmanship are meaningless at this point. I am fairly accurate when it comes to judging distance on flat ground. I have seen enough football fields, golf courses and of my own shooting range to get a pretty good idea of what it takes to stretch out the tape to 100, 150, 200, 250 and 300 yards. However, while hunting in the mountains or other unfamiliar environs, I have been embarrassed by how far I've misjudged distance. What's worse than the embarrassment is the probability of wounding an animal. That's why I always take my trusty rangefinder. Personally, I feel the most significant component involved with long-range shooting is the trigger. Shooting long range with a handgun is difficult enough for most of us; add a heavy or gritty trigger to this endeavor and you will experience a mountain hard to climb. I prefer a trigger pull less than three pounds with a clean, crisp break. If I only shot in warm weather, I would favor a lighter pull, but this can be dangerous in cold weather and can result in the gun going off before the shooter is ready. A handgun with a good trigger is a pleasure to shoot, and the shooter doesn't have to fight and wrestle with the gun before the hammer drops. 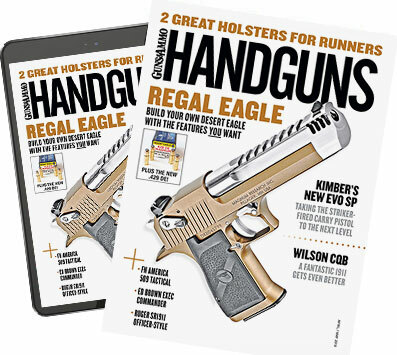 Due to excessive litigation these days, good triggers from out-of-the-box handguns are difficult to obtain. The good news is that reputable gunsmiths can remedy this problem very quickly. Handgun enthusiasts will benefit from a good trigger regardless of the distance at which they will be shooting. for .284 Winchester. The 3-12X Burris scope and rangefinder combine to make this bolt-action handgun ideal for hunting. Another challenging factor that significantly affects downrange performance is wind. I have read charts and equations dealing with this subject, but I would have to say from experience that the ability to judge and deal with wind drift is more of an art than a science. There are just too many variables to consider. The wind could be gusting at a 45-degree angle at the target and be totally different where the shooter stands. It could be swirling, or gusting, one second and changing directions slightly or drastically seconds later. A few years ago I was enjoying a prairie dog shoot in Montana on a windy day. I was shooting a 14-inch Contender in .223 Remington using 52-grain Black Hills ammo. With a fairly strong crosswind, it was not uncommon for the bullet to drift off course from one to two feet at ranges of 200 and 250 yards. Lighter bullets like the 50-grain class of .223 rounds are affected by the wind much more than the heavier .25 or .284 caliber bullets. If I were doing a lot of prairie dog shooting in strong winds, I would definitely step up to a larger caliber than a .223. While we're on the subject of bullets, the long, slender, pointed bullets with good ballistic coefficients are usually a lot more accurate than flatnosed, revolver-type bullets. This is just one of the reasons why single-shot handguns always have the advantage over revolvers and automatics in long-range shooting. The higher the BC and velocity of a streamlined bullet, the more easily it zips through the air and bucks wind. I prefer boattail bullets when really long shots are undertaken. Generally speaking, a boattail bullet will retain more velocity and result in slightly flatter trajectory. One thing to keep in mind is that some bullets with the highest BC ratings are match bullets designed to punch paper or other competition applications. They are not designed for, and should not be used for, hunting. The Thompson/Center Contender, with its interchangeable barrel system, is available in many calibers. For competitive shooting or hunting, the Contender is a good choice because of its versatility. If you are genuinely interested in becoming a better long-range shooter, then there is absolutely no substitute for practice. Shooting is a physical skill much like playing volleyball, baseball or tennis, and the only way to gain proficiency is by practicing these skills, the correct way, over and over again. Our family farm provides a great place for me to shoot at long distance. We have nine-inch steel plates and other silhouette targets placed out at 100, 150, 200, 250 and 300 yards. Practice sessions involve shooting several rounds at each one of these targets, so I have the opportunity to know where my bullet is hitting at various ranges. Consistent practice will provide the confidence to tackle targets like a prairie dog or pronghorn antelope when hunting season rolls around. I'm sure there are many handgunners reading this who feel we should stalk our game as close as possible before shooting. I couldn't agree more. However, if you hunt long enough, there will sooner or later be a circumstance when it's impossible to sneak within 50 yards of your quarry, forcing the hunter to tackle the long-range shot. I just want to be prepared when that happens. Mark Hampton has written numerous articles in many shooting and hunting magazines. His book, Handgun Hunting, a comprehensive look at hunting adventures on six continents, was recently published by Krause. A member of the Missouri House of Representatives for the past four years, Hampton has been a strong promoter of Second Amendment rights and sits on several committees that pertain to public safety, law enforcement and firearms safety.